As NETFLIX becomes more of an entertainment behemoth, the streaming service is branching out from prestige television to films. The conceit from culture dinosaurs (your reviewer is now raising his hand and waving it madly), is that anything that skips theaters and goes straight to video must be somehow “less”. We need to get over ourselves. Bong Joon Ho is the South Korean director responsible for the underrated 2013 Sci-Fi adventure SNOWPIERCER. So he’s back with another story that paints a demented version of the future. This time his target is corporate greed and his device is an adorable little girl who is just trying to save her genetically enhanced pig. That pig is OKJA. She is one of 26 pigs distributed to farms around the world by the Mirando Corporation. The one raised most successfully will be brought to New York where the pig will be shown off before slaughter. That last part isn’t revealed outside the company. Once the little girl Mija realizes what’s going on she tries to stop it, but she’s a little girl. What can she do? That’s where a group from the Animal Liberation Front led by Paul Dano steps in to help and expose Mirando’s lies. Several rescue attempts and twists later they wind up in New York and then a slaughterhouse in New Jersey. Bong (and co-writer Jon Ronson) makes his point with a sledgehammer, but it’s never annoying. We know where he comes down. That’s clear by the characters associated with Mirando. Tilda Swinton in a dual role as the overly earnest, out of her depth CEO and her evil sister. Giancarlo Esposito as the brains behind the evil plans. And Jake Gyllenhaal as a Steve Irwin type reality show host who is incredibly insecure and slightly drunk. Those four characters are drawn as completely nuts. So, yeah we know where this is going. 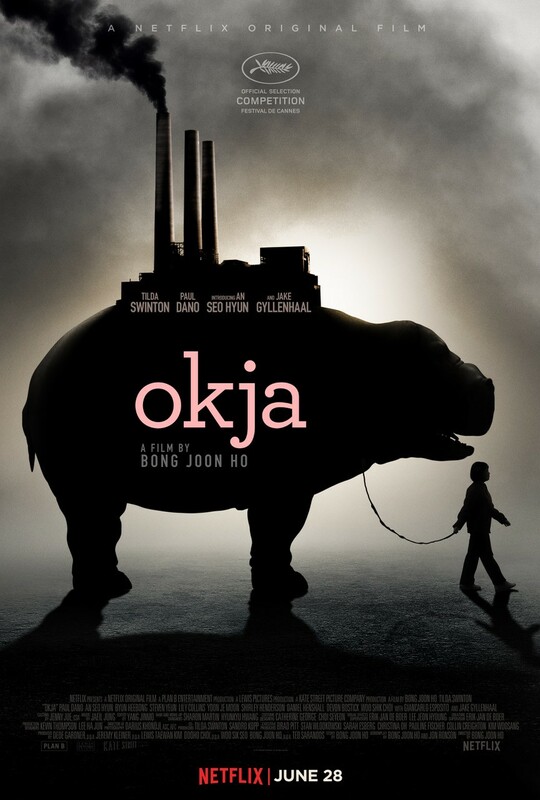 OKJA is kind of a shaggy pig story. The genetically enhanced pig is hippo-sized with a beautiful personality. It is also seemingly more intelligent than most of the humans in the movie, save Mija. This is altered reality sci-fi. It’s not true, but you cannot totally dismiss the possibility that it could be. In the end OKJA is less about its message than the sweet relationship between a girl and her pig. And that may make you love the movie as much as I did.